Belton Lane Children’s and Community Centre was opened in July 2006. The Centre is accessed from a cul-de-sac off Queensway. 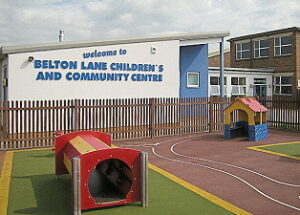 It shares its land with an adjoining Primary School and a Nursery. Follow arrow on map to get there. To see surrounding area, click on map. The post code for Sat Nav should be NG31 9QB. The official post code is for the front entrance to the school. You cannot get to the Children’s Centre from there ! GAIN holds a Coffee Morning here on the 3rd Monday of the month in school term time, 10am – 12noon. See Home or Calendar for next date. Inside, the open-plan meeting area is in the foreground. The reception area is on the left, in the background. Through the hatch on the right is a well equipped kitchen. The sensory room is free. It can have a calming effect and help to develop awareness of a child’s surroundings. Ask at reception to book a time in the diary. What’s on at the centre? 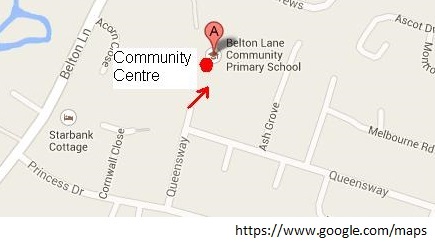 Click on Grantham Children’s Centres. One of these events is KIDS’ Support. It is for pre-school children with additional needs.